Coffee: as college students, we like it a latte. For caffeine junkies, the first cup of coffee in the morning is a religious experience. Our nostrils fill with the smell of freshly brewed coffee grounds, our taste buds perk up upon the first sip and our bodies come alive as the jolt of caffeine hits our veins. From this obsession, coffee shops were born. 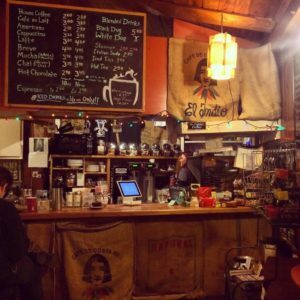 Tallahassee is fortunate enough to host a wealth of independent, adorable and delicious coffee shops for your tasting pleasure. Skip the Strozier Starbucks and visit one of these spots instead. Lucky Goat got 5-stars on Yelp for a reason. 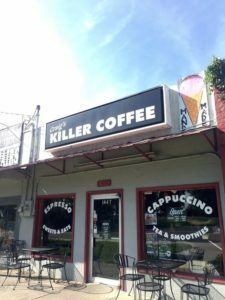 From its spacious, industrial style shop to it’s robustly flavored coffee, it’s hands down the best coffee shop in Tallahassee. You will utter the word “wow” at least 10 times before you reach the bottom of their famous cold brew “Tally-cino”. 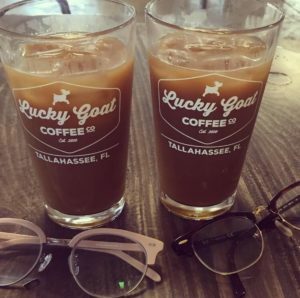 Lucky goat is worth the 15-minute drive from campus for both its coffee and its ambience. “I love lucky goat because it’s a coffee shop that’s truly dedicated to the art of coffee! From the decor to the latte art to the cold brew, every detail is deliciously perfect,” Florida State University senior Maria Rodriguez said. Located in Midtown, RedEye Coffee always bustles with college students and young professionals. It’s a picturesque environment, get your iPhones ready, Instagram addicts. If the red walls and latte art don’t already impress you, your heart might stop when you try the Nitro cold brew. One thing really sets RedEye apart is that you can pair sushi with your coffee. While the concept of coffee and sushi might sound fishy to you, they pair together better than you’d think. “I love RedEye because it has a charming atmosphere and killer cappuccino. 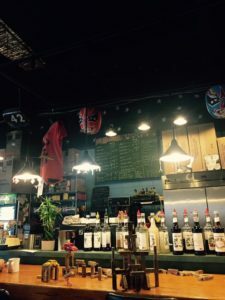 It’s lights make it very homey and the staff is warm and welcoming,” FSU junior Kinsey Seacord said. 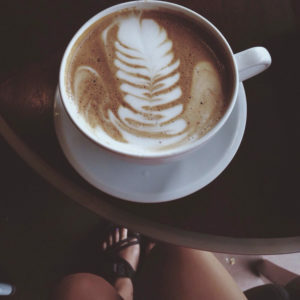 “My favorite coffee shop in Tallahassee is Catalina Café because it’s really small so it feels warm and comfortable! Sitting outside on the massive tables drinking a warm latte is heaven,” FSU junior Celli Horstman said. 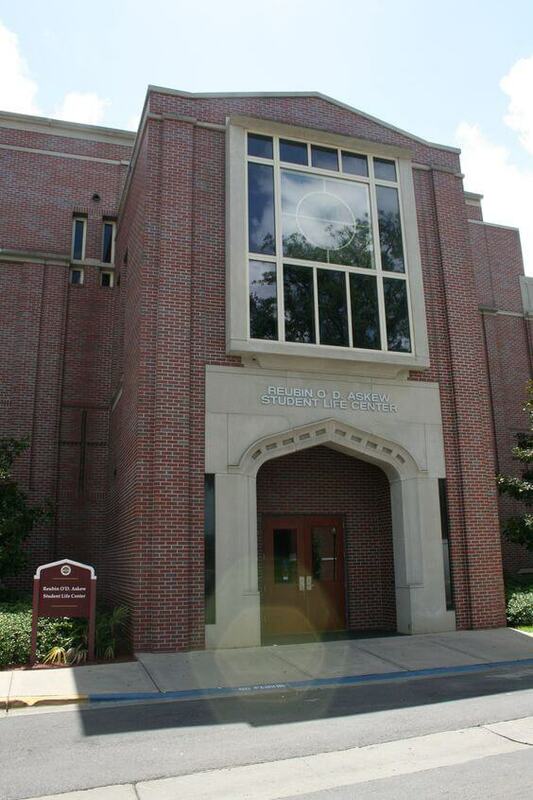 With its new location right by campus on Gaines, there’s no excuse for FSU students not to check out Catalina Café. Apart from their stellar coffee, Catalina ranks high on Yelp because of their delicious food items including their turkey, brie and rosemary melt. On sunny days, sit on the patio with the sun on your face watching the Tallahassee locals walking their dogs around the lake with a cold brewed coffee. On rainy days, nestle inside with a hot tea in one of their intimate two-seater booths. “I love sitting on the porch at Black Dog café with a black iced coffee in my hand,” FSU junior Marisa Valdez said. “The tree that branches over the porch is so encompassing that you feel like you’re a part of it. The nature there is just really beautiful.” For Scrabble enthusiasts, Black Dog Café offers a Scrabble tournament on Friday nights with coffee-related prizes. Despite its name, All Saints Café welcomes both saints and sinners. 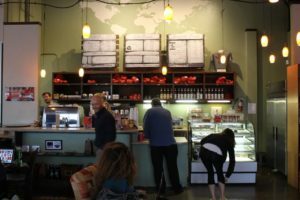 The shop’s dirty Jenga game and chalk-covered bathroom walls make it the quirkiest coffee shop in Tallahassee. It’s open 24/7, so bring your friends to All Saint’s when you get a hankering for 3 a.m. Jenga and coffee or when you need to sober up after a night at Pots. There’s plenty of seating indoors and outdoors in the porch area for you to play games, write, read or draw. “I really appreciate all of the vegan items they have at All Saints Café! Especially the baked goods. The banana bread is to die for,” FSU sophomore Shelby Bowers said. “My family loves going to Craig’s because they have awesome decaf coffee, chai tea and their quiche is the bomb,” FSU sophomore Michelle Lamm said. Browse through the antique store and take a seat at the coffee bar to really immerse yourself in the Craig’s experience. It’s an eccentric hang out with its retro bar stools and old movie collection just feet away. Located on Apalachee across from Governor’s Square, it’s a perfect place to grab some killer coffee when you need a break from campus life. Stop by Eternal Grounds coffee shop for your daily dose of coffee with a side of Jesus. 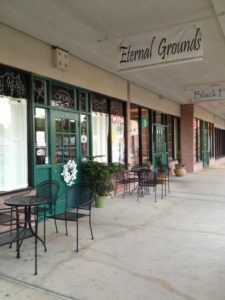 Eternal Grounds is a Christian-based coffee shop on Village Square B. It’s a homey little shop with plush leather seats surrounded by wooden tables. With ungodly low prices, you’re sure to leave feeling caffeine buzzed and #blessed. Located on campus in the same building as the Student Life Cinema, The Grind House is every movie nerd’s dream come true. Check it out for your pre-film caffeine fix. They offer movie themed blended drinks like the Zoolander, Psycho and The Hangover. My drink of choice is “The Darjeeling Limited,” a warm and satisfying dirty chai that tastes like a hug in a cup. Aside from movies, you can also let the Grindhouse coffee fuel you through an intense game of Settlers of Catan or AA video game contest that they host at the SLC. 9. Brooklyn Water Bagel Co.
“Brooklyn Water Bagel is my favorite coffee place in Tallahassee because they have iced coffee that has coffee ice cubes in it and so many options for bagels,” FSU junior Sara Schluender said. 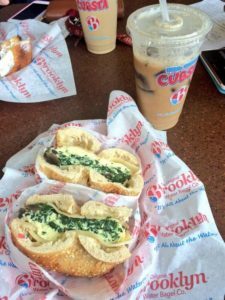 Located in college town, Brooklyn Water Bagel is a popular stop for FSU students for breakfast and brunch. Stop in before your 8 a.m. to grab an iced coffee and an authentic New York style bagel that’s the perfect blend of chewy and crunchy. The Sweet shop on Jefferson Street has been a FSU staple since 1921. Walking into the Sweet Shop, it’s easy to see the mark that nearly a century of students leave on it. Since its opening, students scribbled doodles, phone numbers and random thoughts across its walls and tables. Did you even go to FSU if you didn’t leave your mark on the Sweet Shop? Carless freshmen that need a place to chill close to campus can use the spacious study booths for solitary studying or study groups. While their menu seems a bit pricey, they do serve a wide array of coffee drinks, lemonades, ice cream floats and bubble tea. 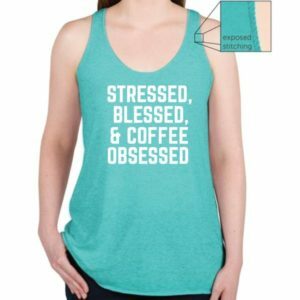 Coffee shops in Tallahassee are super #hip so you’ll need a cute tank.